Jack Cork: Manchester City are the best team I’ve ever played! 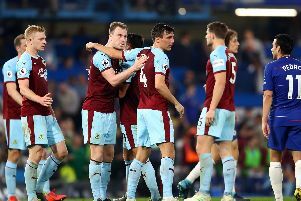 Jack Cork appeared as a substitute for the Clarets when they suffered their heaviest defeat in the Premier League against Manchester City almost eight years ago. Burnley, then under the governance of Brian Laws, were heading back towards the Championship at the time after Emmanuel Adebayor’s double was added to by Craig Bellamy, Carlos Tevez, Patrick Viera and Vincent Kompany. Steven Fletcher netted the home side’s consolation at Turf Moor in the 6-1 loss as Roberto Mancini’s side went on to claim fifth spot and a place in the Europa League. But Cork, who replaced Kevin McDonald that day, believes that the latest version of the Citizens is the strongest opposition that he’s ever faced in the top flight. With 12 games of the campaign remaining, Pep Guardiola’s men hold a 13-point advantage over neighbours Manchester United, though Johann Berg Gudmundsson stalled their title charge temporarily. “This Manchester City team is the best that I’ve ever faced in the Premier League,” confirmed the midfielder. “It seems like in these last couple of seasons that teams are changing. “There’s a lot more running and a lot more power, there are more tactical sides than there used to be. “They were good. When we thought we had them sometimes, we tried to get them in the corners too, and at their keeper, but they managed to get through or were clipping balls in to little spaces that we thought we had covered. “They’re top quality, they’re a club that’s spent a big amount on players, that’s why they’ve got quality all over the pitch. It was the first time in the league this season that the table toppers had failed to go on and win in a fixture where they’d taken the lead. That ultimately made Burnley’s point even more impressive as they refused to park the bus against a team that had scored 102 goals in all competitions. Ederson made two excellent saves in the game to deny Ben Mee and Aaron Lennon after Danilo had put the away side ahead. And Cork was delighted with that attitude. “It’s a massive point,” he said. “We didn’t give up after going 1-0 down. We kept going, kept plugging away and we had a lot of good chances. “I think a point was deserved in the end. We worked hard throughout the whole game and didn’t let our heads go down. He added: “We’ve been unlucky at home against the bigger teams. We were due that one today.